After the Seaside Regional, we played at a few club games in Oregon and Virginia. Here are a few problems from those games. All problems matchpoints. Check the Comments section for what happened at the table and what others would have done. RHO opens 2H, and the opponents are silent thereafter. You pass, and partner balances with 2S. Your call. You open a strong 2C. Pard bids 2D [artificial; no aces, at most one king]. You rebid 2NT. Pard Staymans, you deny a major, and pard bids a Smolen 3H, showing five spades and four hearts. What's your bid? Partner opens a "good 14-17" 1NT, and RHO passes. What's your call? There are three passes to you. You open 1H (would you?) and LHO overcalls a natural (!) 1NT -- explained as 11-13 HCP, usually a heart stopper. Pard doubles, and RHO bids 2H (transfer to spades). You're up. Before we get started describing this convention, let's do a quick definition of terms. In the first auction, there's been a jump bid; in the second auction, only two suits have been bid. In either case, Snapdragon is off. 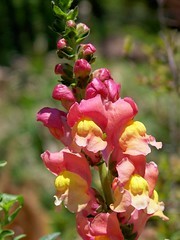 So what does a Snapdragon double show? to me, I double to show competitive (or better) values, length in diamonds, and honor-doubleton or better in hearts. on the same auction, I bid 2D, showing values and length in diamonds but no tolerance for partner's suit. Partner will be able to judge the later auction much better with the information about your length in his suit. in the same auction -- (1C) 1H (1S), I'll Snapdragon double and then pop to three hearts, trying to show a diamond lead-directional raise to 3H. The double shows [exactly four] spades, so why not treat the auction the same way as the previous one? Clubs, hearts, and spades have been shown, so redouble can logically be used as Snapdragon in this situation. It was three months ago today that we launched this site. We originally thought this would be a nice place for our friends to keep up with our travels and a fun way to share hands. I figured that maybe 15-20 people would log on every once in a while, and maybe someone would give feedback once a week or so. As it turned out, we've had an amazing 180+ comments from our readers! I'd like to thank all of our commenters - especially Noble, Jenny, MemphisMOJO, and Kevin. As time went by, we found that it wasn't just our friends that were reading and commenting. Other bridge blogs were linking to us, and Google sent many folks our way. So far, we've had over 1,000 unique visitors to the site from 52 countries and 46* states! All that being said, I'm sure we can make this a better site (while keeping it less than five hours work per week). Please let us know how we can make the site better or more useful. We'll be at the Virginia Beach Regional next week, and at the Boston NABC at the end of the month. Please feel free to find us and let us know how to make this site more entertaining or more useful. If you won't be at either tournament, please comment here or send an email-- McKenzie or Meg at DoubleSqueeze.com. One last big thanks to all of our readers! *If you know a bridge player in Montana, South Dakota, West Virginia, or New Hampshire, please send them a link to this site! We want to get all fifty states before the end of the year! 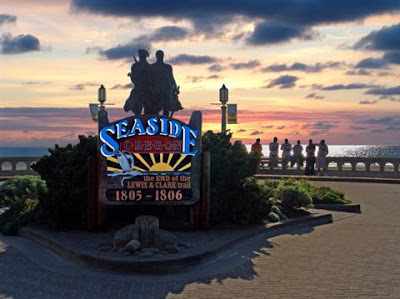 Shocking my loyal readers, I'm actually finishing my report on the Seaside Regional in the same month as the tournament! Here's a few problems that Paul and I faced at the table. Check out the Comments to see what we decided and what others would do. Feel free to leave your opinion too! You pass in first chair. LHO opens 2H. Pard doubles, and RHO passes. What's your decision? Partner passes in first seat. RHO opens 1S. Do you bid? LHO opens a strong notrump. Partner passes, and RHO bids 2H, transfer to spades. What's your call? You open 1C (do you? ), and partner makes a game-forcing raise of 3C. What's your bid? Stacy Jacobs posted her reply to Meg's post on getting younger folks to the bridge table. Read Stacy's take on Junior bridge and trying to get the average age of ACBL members down below 80 here. We've put a lot of work into our responding structure over a 1NT opening. One recent innovation we've put on the card is "Transfers Over Transfers", gleaned in no small part from this 2005 post by Justin Lall. The best description of why transfers over notrumps work so well was by (I believe) Jeff Rubens - he said that basically responder gets to bid twice while opener bids zero times! Transfers are incredibly useful in many different areas of bidding. Hopefully I'll live long enough to write about all of them! The way we play this is just a bit different from Justin's original layout. Note that we can't transfer to spades. A good hand with five hearts and four spades will go through Smolen. A bad hand with that shape bids 2C then 2H weak. An invitational hand with that shape can either bid 2D then 2N (not showing the fourth spade) or 2C then 2NT (not showing the fifth heart). Sorry, can't do everything! There's a similar response structure over 1NT - 2D - 2H - 2S [showing clubs], except there's now a 2NT rebid available to opener. 2NT now shows a minimum, and 3NT shows a maximum [no fast arrival bids in notrump! Jumping to 3NT shows extras]. The transfer to hearts is 5+, because with 5-4s we go through Smolen. It's a slam try, because with 5-5s without slam interest, we start with 2C - over 2D we bid 4C showing that hand. The only difference between the spade structure and the heart structure is that opener can "cuebid" 3S over the 3H bid with good spades. What do you think of this response set? Any suggestions for improvements? A few days ago I posted various defenses to a big one (and two) club opening, but I saved my favorite for today: Suction. So all one-suiters can be shown in Suction by bidding the suit below the real suit. Touching two-suiters are shown by bidding two suits below the lower of the two. That only leaves non-touching two-suiters: clubs - hearts and diamonds - spades. With these two combinations you bid some number of notrump. Your LHO opens 1C (strong, artificial, and forcing). Partner jumps to 3C, showing either long diamonds or both majors. Since he could've just bid 2C showing the same suit combinations, he must have lots of distribution. So what's your bid? I bid 4S! We either have an eleven-card diamond fit (if partner has diamonds only, he should have 7 since he forced to 3D) or a ten-plus-card spade fit (partner should be at least 5-5 if he has both majors). Remember: You can't bid your own suit here. You're responding to your partner's suit (or suits). If there's a big misfit, get out as low as possible! Some enterprising souls play Psycho-Suction. This throws lots of confusion into the auction for both the big club side and the defensive side. Psycho-Suction is just Suction, but one step lower -- so if you have a one-suiter, you're bidding that suit. This has the advantage that responder, hoping partner actually has the suit he bid this time, can pass the Suction bid, but that's not much of an advantage when overcaller actually has the next two suits! Psycho-Suction should only be played by those with a lot of practice with Pass or Correct bids and a good sense for when and how to get out of trouble. The king of confusion is Inverted Psycho-Suction. With IPS a bid shows either that suit and the next suit up or the one above that! So, over a big 1C, 2D shows either both red suits or spades. To play Inverted Psycho-Suction, the two criteria above are still in place, but you also need both partners to have a very good sense of humor! After winning the first pair event, we had no luck the next four days, so Paul and I finally made the switch over to IMPs for Saturday and Sunday. We entered (and quickly exited) the Compact Knockout. We had much better luck in the evening Swiss, however. Isn't it amazing how much better your luck is when you're playing well? All problems IMPs. Check out the Comments section at the end of the post to see what we did and what others would do. Also, feel free to leave a Comment yourself! You pass in first chair. LHO opens 1D, partner makes a weak jump overcall of 2S, and RHO passes. Your call. LHO opens 1S, and RHO bids a forcing 1NT. Do you bid? LHO passes, partner opens 1H, and RHO overcalls 2C. You put in a 2S bid [natural and non-forcing, by partnership agreement]. Partner now cuebids 3C. What's your bid? In third chair, you open 1C (do you?) and LHO overcalls 4S, which gets passed around to you. What's your action? RHO, in first chair, opens 1H. You're up. Partner opens 2C. Happily, you have a bid for this hand – 2NT shows three suits headed by the ace or king. Pard rebids 3NT, and it's up to you. You open 2C (anyone for 1S? ), pard bids an artificial game-forcing 2D, you rebid 2S, and pard comes out with 3D! What to do with this pleasant turn of events? Last week I promised to talk a little bit about various defensive structures when the opponents open 1C strong, artificial, and forcing (as in Precision). I won't give an opinion on which I think you should play -- you need to find the right balance of preemption, fun, and memory work for your partnership. But whatever you choose to play, get in the auction! When the opponents open a big club on your right or they open a big club on your left, partner passes, and they bid a "little diamond" on your right, double shows both majors, and one notrump shows both minors. That's all there is to it. The first big club defense I learned was CRASH. This is a quick mnemonic for Color, RAnk, SHape. CRASH uses one more bid than Mathe: 1D. So it doesn't quite work over (1C!) P (1D!). Double shows two suits of the same Color. One Diamond shows two suits of the same RAnk (minors or majors). I've also seen some pairs playing SHARC (SHApe, Rank, Color). This has no theoretical advantage to CRASH, but if you think it's a cooler acronym, definitely play it rather than CRASH! Since partner either has the minors or the majors, you know there's a big pointed-suit fit somewhere. So you bid... 3D! Partner has at least four cards in one pointy suit, so you have at least nine trumps somewhere. The three level shouldn't be too high. Partner will pass (or maybe raise!) holding both minors, and will correct to 3H holding both majors. You'll correct 3H to 3S, and you've found your fit and your level! and pard overcalls with 1NT (SHape), don't bid 3C! He'll correct to his cheapest suit (because he almost certainly has spades and diamonds). Start with 2C, and when partner corrects to 2D, he'll get the message that all you have is clubs when you rebid 3C. Paul and I continued in the pairs for the fifth day in a row. I think everyone in the room was getting tired by Friday... there were some wacky things going on (like my RHO's 2C overcall of partner's 1C -- not alerted as natural, but passed by my LHO -- with 62 J653 AJ3 AKJ4; it was only down one when we couldn't figure out what the heck was happening). We certainly didn't do anything spectacular. Your LHO opens a 10-12 1NT, and your RHO bids a "gambling" 3NT. Partner leads an attitude four of clubs (attitude = low from interest), you play the king, and declarer follows with the deuce. What's your play to trick two? Howdy folks... just a quick update. My apologies for the lack of posting the last few days. We've been in transit (Bend, OR to Seattle, WA to Salem, OR to Washington, DC to Charlottesville, VA) since last Friday. We arrived back in the Old Dominion late last night (actually early this morning). We'll get back to the four or five days a week schedule shortly. There's still some great hands from the Seaside Regional to share, as well as some club adventures from Bend and Seattle. Stay tuned! Paul and I continued in the pairs on Thursday of the Seaside Regional. We didn't make the overalls, but scratched a bit, so we felt pretty good about it. All problems matchpoints; read the Comments section below for what happened at the table. You open 2C (do you? ), pard bids a game-forcing 2D, you rebid 3C, and he surprises you with 3D! What's your bid / plan? LHO opens a 10-12 1NT. Partner passes, and RHO bids a "to play" 2H. This is passed around to partner, who balances with 2S. Should you move over this? South opens 1C, and rebids clubs at his first turn. To my loyal readers: Yes, I know I'm bouncing around chronologically a lot, but we're currently traveling -- hopefully someday soon I'll have a few hours of free time to pound out the report you deserve from the Regional. The Seaside Regional is over, and it was a smashing success. Paul and I had a great time, playing mostly pairs, and we came away with somewhere between 20 and 25 points. The tournament itself was very well populated -- up a few hundred tables. In the next few days, I'll post more session recaps. Stay tuned! In the pairs yesterday at the Seaside Regional, I declared a hand with a little help from my friends... Nobody did anything awful, but we ended up with a ridiculous result. Partner opened 1S in third seat (by partnership agreement), I responded 1NT, and everyone passed. The six of diamonds was led. I played the queen, dropping the ten on my right. I led the jack of clubs, covered by the king (good play). I could have ducked this and dropped the queen on the next round for five club tricks, but were I to duck it, finessing again (playing East for KQx) would probably have been my play. But I wasn't going for all those tricks. All I was looking for was five tricks. -100 seemed like it would be a good matchpoint score. So I went up with the ace and shot a club back. West won the queen and switched to the......... queen of hearts! I covered with the king, and East won the ace. He switched back to diamonds, and I let him hold the jack. He then went back to hearts. I won and reeled off lots of clubs. West felt that he was in a pinch. He pitched his last heart and a spade, then decided that his diamonds couldn't take a trick... right he was! he pitched his eight of diamonds, then, on the last club, the king of diamonds. I pitched the ace of diamonds from dummy! The 9-4 in my hand were good, and I gave up a spade at trick 13 for making three. We had a better day in the pairs on Wednesday-- a bit below average in the afternoon, and a solid 57.5% in the evening. All problems matchpoints, of course. Partner opens 1H (4+, usually 5+) in first seat. What's your bidding plan? Righty passes, and it's your call. The auction goes (P) P (1N 15-17) to you. The cheapest you can bid clubs is 3C, and double is artificial. Do you bid? LHO opens 1C, partner overcalls 1S, and RHO passes. Do you have a call? You open 1C (our partnership agreement with 5-5 in the blacks), LHO overcalls 1D, and partner leaps majestically to 3NT. Do you pull? Paul and I continued along in the pair games on Tuesday, with less success than Monday. We scratched both sessions, but didn't make the overalls. RHO opens 1H. Assuming you double, what is your action over partner's 1S? You pass in first chair, LHO opens 1H, pard overcalls 2D, and RHO jumps to 4H. Do you or don't you? Pard opens 2H (!) in second seat, and RHO overcalls 2S. Your bid.